Located near the heart of Bangkok's vibrant city centre, the stylish Pullman Bangkok Grande Sukhumvit offers 325 contemporary rooms and suites, fully equipped with the latest technology and free WiFi access. Just 400 metres from Asoke BTS Skytrain Station and Sukhumvit MRT Station, Terminal 21 Shopping Mall is only a 5-minute walk from the hotel. Various restaurants and nightlife are a short walk away from the hotel. Several main shopping malls, including Siam Paragon, MBK center, Central world, Central Chidlom can be reached within a short BTS ride away. 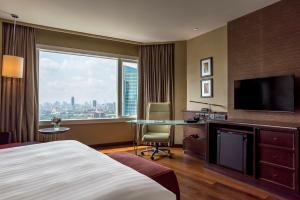 Suvarnabhumi International Airport is a 30-minute drive from Pullman Bangkok Grande Sukhumvit. Air-conditioned rooms and suites features flat-screen satellite TV and a private bathroom with a bathtub. They also include a safety deposit box and a minibar. Guests may exercise at the fitness centre, enjoy a pampering treatment at the spa or cool down by the swimming pool. Other services and facilities at Pullman Bangkok Grande Sukhumvit include laundry services, meeting facilities and a 24-hour front desk. Seafood buffet is served at Atelier restaurant, while Mediterranean cuisine and steaks can be sampled at Tapas Vino. An array of homemade pastries and desserts can be found at Flourworx. Inblu features both indoor and outdoor relaxing with live music, serving snacks and refreshing drinks. Please note that Suhoor meals can be served in the guestrooms during Ramadan. Offering a spacious work desk, this air-conditioned double room has an en suite bathroom with C. O. Bigelow amenities, a separate bathtub and shower facilities. Smoking rooms are available upon request. Rate: THB 4853.56 ... THB 11373.50; select dates below to get current rates. Located on a higher floor, rooms feature panoramic city views and a spacious work desk. En suite bathroom offers C. O. Bigelow amenities, separate bathtub and shower facilities. Benefits include: - 3 complimentary laundry items per stay - 6 complimentary cans of soft drinks from the minibar per day - 1 complimentary cocktail at InBlue per person per stay Smoking rooms are available upon request. Rate: THB 4301.93 ... THB 12593.90; select dates below to get current rates.